Shot in 2006 and 2007 with the sponsorship of the Central American and Caribbean Audiovisual Promotion Fund, Curundú is the debut feature of young Panamanian filmmaker Ana Endara. 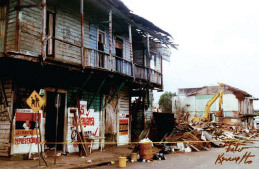 The film follows Kenneth, a charismatic “retired” delinquent‚ who earns his living taking pictures of his neighbors in Curundú, an overpopulated and precarious community, located not too far from the thriving commercial and business center of Panama City, on the edge of the former Canal Zone. The documentary speaks to us about Curundú, stigmatized as one of Panama City’s most dangerous slums, through Kenneth and his photos.